« Looney Tunes in Islands of Adventure? You’d think with over 100 years of movie making under its belt, Universal Studios has a large pool of pretty impressive characters and films to choose from when adding new entertainment to their parks. Unfortunately, that doesn’t seem to be the case these days. A week after Labor Day 2015, Universal Studios Florida rolled out a new line up of street entertainment throughout the park. Check out the video above for Straight Outta Food Truck, a street show where two performers make up improv raps based on audience input. No doubt the crowd loved their show and even stood out in the rain to watch them perform. Even though it wasn’t really my thing, I judge a show by the audience reaction and not mine. No doubt, this will be a popular show. 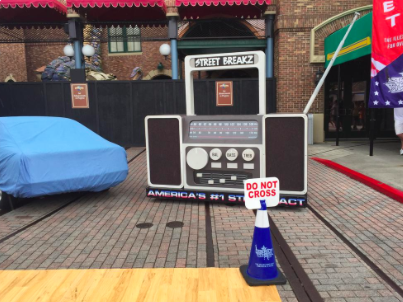 Next was a show called Street Breakz which is performed in front of the former Disaster attraction. This show was actually performed several years ago during peak seasons at Universal Studios Florida in the New York section of the park and has returned. It’s also important to know that these shows are highly likely not written or produced by Universal Entertainment. All the shows mentioned today are bought from an outside company and are signed on via contracts and may be tweaked by each park. Disney, Universal, Six Flags, Cedar Fair and every single theme park in the world outsources at least some of their entertainment. It saves on overhead and the parks can deliver a finished product in a fairly short amount of time since the performers know their routines before they even know what park they will be performing in. Which brings me to my point. What makes parks like Universal Studios Florida a unique theme park experience that stands above the rest is that attention to detail. This is the place where you can meet movie stars like Doc Brown, Marilyn Monroe and Homer Simpson. While percussion based shows like the one above may be fun and entertaining, are they the right fit for a movie based park? This has nothing to do with the performers who do these shows, who no doubt will read this. I think they do an excellent job. Rather, this is aimed at the Universal Studios Florida Entertainment Department, who I know also reads Theme Park University. I know upper management makes irrational decisions and demands more entertainment on a small budget. That’s operational reality. However, my request is, take the time and work with these groups to blend in with their environment. The bang for your buck will go so much further with some slight adjustments to these entertainment offerings. Here’s hoping the powers that be read this and understand that the shows reflected in today’s article can be seen in any amusement park and that Universal Studios Florida needs to differentiate their brand in order to stand out. Your thoughts? This entry was posted in Universal and tagged entertainment, Fresh Outta Food Truck, Street Breakz, Universal Studios Florida. Bookmark the permalink. Trackbacks are closed, but you can post a comment.